Dario T. "Tony" Palermo LEOMINSTER, Mass. 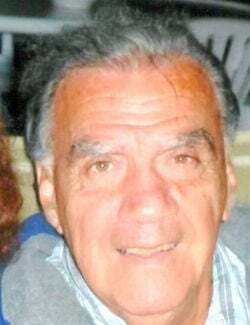 — Dario T. “Tony” Palermo, 93, formerly of Waterbury, passed away peacefully on Saturday, March 30, 2019, in Leominster Hospital, surrounded by his loving family. Tony was born in Waterbury, Vermont, a son of the late Giovanni and Carmella (DelGiudice) Palermo. He enlisted in the U.S. Navy in 1944, where he proudly served his country during WWII until his honorable discharge. He spent his career working for Sears Roebuck as a credit manager, retiring in sales after 30 years. Tony was a member of the Sons of Italy, American Legion, Italian American War Veterans. One of his greatest joys was cooking, whether for family or friends, Tony was always happy creating meals for others. In his retirement, he volunteered at the Veteran’s Hospital in Bedford. He cooked for fundraising events for many organizations, including the Rotary Club, Serra Club, American Legion, Italian American War Veterans, Special Olympics, Sons of Italy and Our Father’s House. Tony was an avid fan of the Celtics, Red Sox, Patriots and Bruins. He loved traveling after his retirement to Greece, Italy, Ireland, Mexico and Aruba. He always looked forward to spending time at the lake house, where he enjoyed cooking and making campfires. Tony loved his annual summer vacations to Hampton Beach with family and friends for over 40 years. He will be fondly remembered for preparing everyone’s favorite sandwiches, with “the works!” He is survived by his beloved wife of 57 years, Joan (Putnam) Palermo; his daughters Andrea Boccia and husband Stephen, Valerie Mackey and husband Roger, and Maria Herbert and husband Gregory; seven grandchildren Alyssa, Sean, Collin, Chase and Quinn Mackey and Madison and Tanner Herbert; a sister, Gena Cahill; several nieces and nephews. Tony was predeceased by his son, David Palermo; his brother, Biagio Palermo; and his sister, Elvera DiPietro. Calling hours will be held in Brandon Funeral Home, 305 Wanoosnoc Road, Fitchburg, on Sunday, April 7, 2019, from 2-4 p.m. A service will follow at 4 p.m. with military honors in the funeral home. Burial will be held privately.